June Gloom we call it along the coast – the marine layer that hangs over us, dulling scenery and spirits for almost all of this month’s 30 days. Even worse, it drags directly behind May Gray, thus insuring a double dose of semi-drizzle and we are not sure if spring is really happening. It’s also hard to know what to wear during this gray and gloomy time. The sky is overcast and the air makes us shiver, so we put on a jacket and a scarf and then when we drive a mile inland, we roast. Away from the coast, people are lightheartedly skipping around in sandals and shorts or sundresses. It is Spring, of course, but evolving slowly, not at all like springs in colder climates where there is snow and then bright pokes of green and sudden riots of color. When my family moved here from Montreal, gardens were thriving and it was warm and sunny back home. In our new home, my sister and I could hardly wait to run down to the beach. We froze. It was May. There was no golden sun in our California at all. But now that I’ve lived through many such Mays, I’ve realized that there is a purple lining in our silver skies as our coastal spring unfolds, a royal glow as purple blooms everywhere. Jacaranda trees arching over the sidewalks. Agapanthus, lantana, princess flowers poking out from gardens. 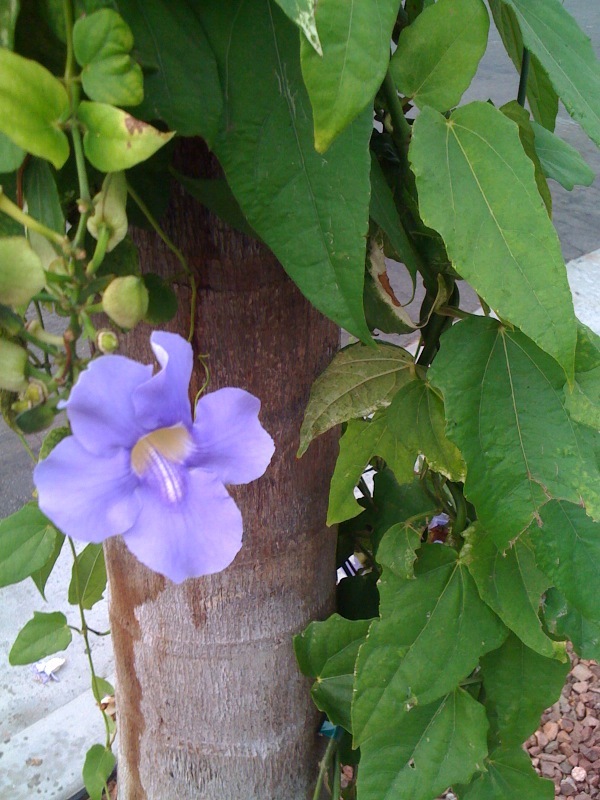 Morning glories climbing fences. Sea lavender standing guard over the ocean. Sage, daisies and mountain lilacs cloaking the hillsides. 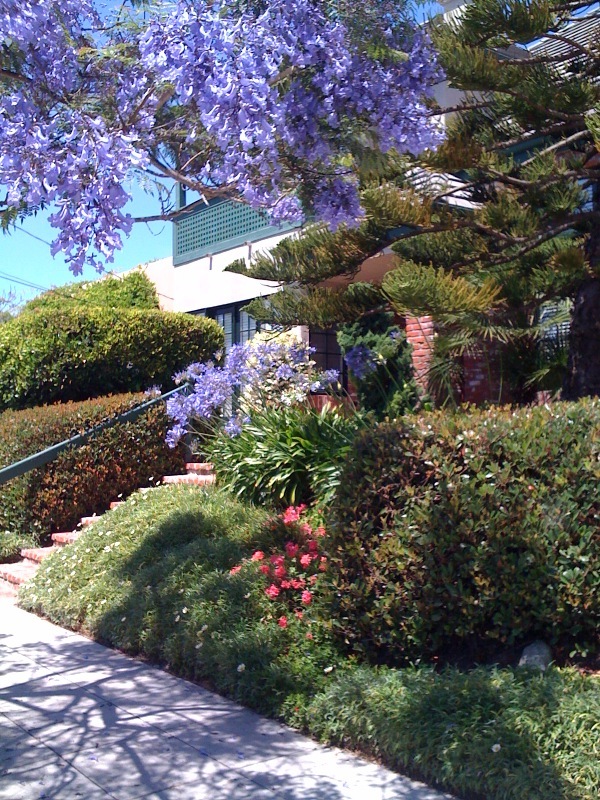 The Jacaranda tree is May/June’s crowning glory and San Diego’s official urban tree. It’s a sub-tropical tree native to South America and was imported to San Diego and Los Angeles in the early 1900s by Kate Sessions, a California horticulturalist and landscape architect, also known as the mother of Balboa Park. The jacaranda also blooms in the fall, but not with the same periwinkle blue-purple brilliance that it does in the spring. The branches bend and bow over our sidewalks, dropping little trumpet-shaped blossoms. I’ll take walking on this magical purple carpet any day over a red carpet. And just as the purple jacaranda canopy fades, it’s July and the blue of the sky takes over. Another purple flower that blooms here in May and June is the agapanthus. They seem to appear suddenly out of nowhere, big, round, purple balls poking scepter-like toward us from front lawns. (There are white agapanthus too, but they are outnumbered by the purple ones.) The agapanthus are originally from South Africa and are also known as lily of the Nile. They grow around the world, even in gray England, where they are called the African lily and mentioned in a Harry Potter book. It’s possible to see a royal connection, resembling as they do staffs of pharaohs and monarchs. They point the way to victory – the clearing of our skies. In Southern California, and especially San Diego, we have one of the best climates in the world. It’s usually never too hot or too cold, so you’d think we wouldn’t complain about the weather. But of course we do, especially by the ocean during spring when we crave some tantalizing, tangible evidence that summer is around the corner. When will this gloom and doom lift? Until it does, it helps to know that the hazy gray sky has a touch of royalty, in the richest sense of the word. Linda, your beautiful descriptions of the flowers and the weather bring back some of my favorite CA memories. Thanks! When we first moved to San Diego, I missed the purple of the Canadian lilac season. Then the jacarandas began to bloom. They don’t smell as sweet as lilacs, but they certainly are as beautiful. Thanks for reminding me of their significance.